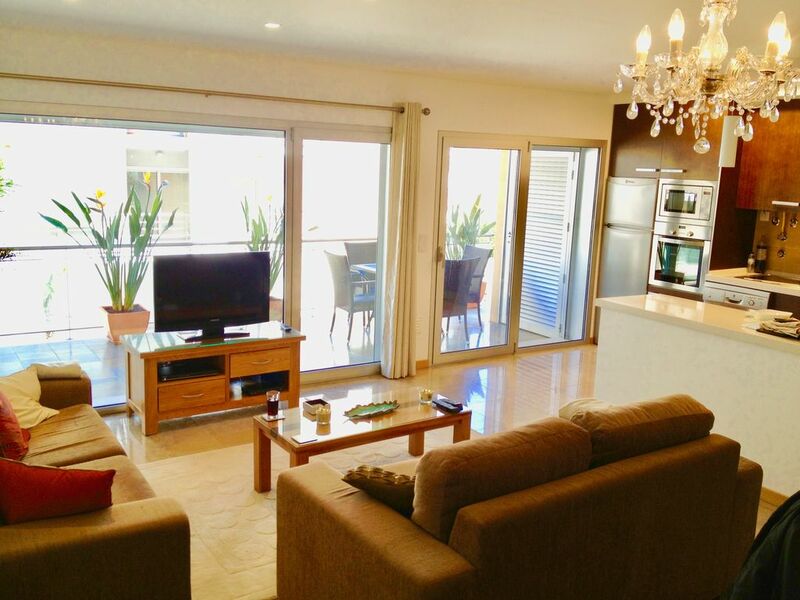 Apartment in Sao Martinho do Porto, Silver Coast, Portugal - Peaceful And Child Friendly Location, A True Golfers Paradise And A Food Lovers Dream! This stunning apartment is furnished to the highest standard and has been granted the required official rental licence ID Number: 9432/AL. It has state of the art air-conditioning, central heating, surround sound music system, central vacuum, electric shutters, intercom entry, polished stone floors and exquisite marble bathrooms. There are 2 good sized bedrooms, 2 bathrooms (1 en-suite) and a deluxe double sofabed (lounge). The apartment is one of the few in the block with two outside terraces, not one. The first is off the living area with table/chairs and sun loungers. The second runs off both bedrooms with a coffee table and chairs. Guests staying in Apartment x also have shared use of a small but delightful, HEATED condo swimming pool (one of only two 'heated' pools in the whole area - heated from June all the way through to September inclusive). There are also adjacent marble WC's, pool showers and a chill out lounge with ping pong table for guests to enjoy. Apartment X, is located in a sought after development which consists of 48 luxury suites and in a building only 3 storeys high. At just over 92 square meters, Apartment X provides ample indoor living space. This is the only apartment in the block with a large ‘green terrace’ – scattered with beautiful tropical plants such as pineapple palms and bird of paradise. Apartment X is also one of the few in the block where the outdoor terrace is not attached to the next door apartments terrace, allowing for far more privacy. Added to that, instead of bedroom windows like many of the apartments, both our bedrooms have large balcony doors leading on to additional outside space. Both bedrooms have surround sound, built in wardrobe, dressing table, hairdryer, electric shutters, curtains, balcony access. The beds are the best on the market, carefully chosen along with high quality cotton bed linen to ensure you have a fabulous nights sleep! Access to the building is by a secure key code entry system and parking is free and available for all guests in either a secure underground car park or one of the many parking bays on the quiet side street below. The apartment is accessible to all - first floor, all on one level with easy access to all rooms and balconies. There are two modern and regularly serviced lifts to all floors. The only steps are just a few from the pavement up to the main door of the building. I work in Media, live partly in Jordan, London and of course, beautiful Portugal ! It's quite simple the best value for money! Bathroom 1: en-suite to master bedroom, bath, shower, WC, bidet, basin. Bathroom 2: walk in shower, WC, basin. The large adjacent communal chill out lounge with leather seating and coffee table has a full size ping pong table and looks out on to the BBQ area and Pool. Ping pong in the communal lounge and a few left from fellow guests such as puzzles. The Silver Coast is a stunning area packed with as many top class golf courses as the better known Algarve. With clear skies and a light sea breeze, the weather on the Silver Coast in September, October, April, May and June is absolutely ideal for play. Mid-week, the golf courses are unbelievably quiet. One of the most stunning golf courses in Europe is less than half an hour away. Praia D'el Rey is just 25 mins drive, Bom Sucesso 20mins, Golden Eagle Golf and Country Club 40 minutes, Campo Real Golf Resort 40mins, Botado Golf Club 20mins, Vimeiro Golf Club 40 mins. There is also the Royal Obidos Golf Resort. Golfing Accommodation: both bedrooms in the apartment have 2 zip link mattresses/beds specifically to create 2 twin rooms for golfing holidays. Storage for golfing equipment: we request that trolleys and clubs are not brought up to the apartment. An underground parking space with remote controlled access for owners and guests only, will be made available. Utility Room: Clothes drying rack, mob, bucket and sun loungers/cushions are all in a storage cupboard outside on the terrace. Cleaning / Towels / Linen / Maid service: The apartment is cleaned prior to your arrival. Bathroom towels, bed linen & beach towels provided. Laundry of bedding/towels is on check-out. Extra cost - welcome basket on arrival (bread, tea, coffee), cleaning service Other: Both bedrooms have surround sound, built in wardrobe, dressing table, hairdryer, electric shutters, curtains, balcony access. The beds are the best on the market, carefully chosen along with cotton bed linen to ensure you have a fabulous nights sleep! The apartment is in a good location, the fantastic beach was only a short walk. The shops & local market were also close by, with a good choice of food (vegan). Also a great Indian restaurant on the sea front called Kinara. Spacious house on walking distance to sea and shops, bus nearby for day trips in the surroundings, heated pool which was much loved by our children and used a lot. Our children were even provided with some toys to use in the pool by the lovely house manager who did a big effort to welcome us. Apartment was in a great location and was clean and well kept. It is quite rare for us to return to the same place more than twice, even if it was great.....however, we have found the exception...Appartment X! This holiday Appartment just an easy hour's drive from Lisbon airport, on an almost empty motorway, is our epitome of a holiday accommodation. It has everything you need plus more! Spacious comfortable rooms, each with their own air con (extremely efficient so no need to leave on when you go out, unlike many other apartments we've stayed in) luxurious marble bathrooms and a full modern kitchen. With a farmers market (amazing fresh fruit, veg and fish caught that morning!) literally a 3 minute walk away, plus a local supermarket within a 5 minute walk, we loved eating in, on the lovely balcony. We made a lot of use of the swimming pool, which we loved for the privacy and the fact that for many periods, we found we had it to ourselves that's the sheer beauty of this private retreat, so quiet and peaceful. Although not "sleepy", Sao Martinho do Porto is definitely a world away from the overly busy, tourist-filled, noisy bars of further south. The Silver coast is definitely still, an unspoilt beautiful Portuguese holiday destination, for the more discerning visitor. Plenty to do, from lush coastal golf courses, to medieval villages, amazing fish markets, fantastic restaurants at very reasonable prices, amazing sandy beaches which were not all crammed with tourists and beautiful forest walks. We had a car and made the most of visiting many areas local to the Appartment. We especially enjoyed driving inland and up in the forests abundant with Eucolyptus trees. Drive with your windows open to breathe in the amazing aromas on the breeze! We discovered a salt mine which still mines in the traditional way, by hand. Although a bit touristy in height of summer, with little stalls to buy holiday pottery etc, was still worth a visit and we did come away with a couple of the more unusual gifts of salt flowers! Obidos, the medieval village, we visited twice because we simply loved it, especially at night! We also visited Lisbon for a day out with its old town, hustle and bustle of an amazing city. We were however, so thankful we had our lovely, quiet retreat to return to and thoroughly enjoyed the silent contrast! As I mentioned at the start of this review, it's rare for us to return to the same accommodation.....this was our third stay and we are already booked for our fourth! The perfect property in the perfect resort! We stayed here over may half term and loved the town and the apartment equally. It's easy to relax here with plenty of cafes and restaurants nearby and the stunning beach with the dune walk. The apartment has everything you will need as well as really high end finish. We felt very luxurious here and loved having it as a base from which to explore the nearby attractions. Sao Martinho do Porto has for centuries been a popular holiday destination for the wealthy Portuguese. It's natural shell-shaped bay provides one of the warmest and safest areas for swimming on the Silver Coast. Cobbled streets and welcoming coffee houses sit comfortably alongside marvellous restaurants and even a cocktail bar! Shops and restaurants stay open all year round so even at Christmas there is plenty to do and see! Sao Martinho-Do-Porto has a stunning and natural shell shaped bay providing the warmest and safest waters in which to swim on the Atlantic coast. Other fabulous beaches in the area include: Salgado - a near deserted beautiful white-sanded beach, Nazare - a vast stretch of sand alongside a thriving town with plenty of bars and restaurants, Foz do Arelho - the Atlantic on one side and a calm lagoon on the other with great beach bars! Also Peniche nearby is the number one surfing spot. The nearest airport is Lisbon, just 50 minutes away. Porto airport is a 2 hour drive. Hire car is not necessary to enjoy your stay as everything you're ever likely to need is within easy reach (max 7 mins walk!) However, we highly recommend having a car in order to fully explore this lovely part of Portugal. The apartment is just a 7 minute walk to the beach, 5 minute walk to a large supermarket and a 2 minute walk to the farmers market for fresh local produce such as fish, fruit and vegetables. For sight see-ers, Obidos, one of Europe's most romantic medieval villages, is just 15 mins by car. Alcobaca with its ancient monastery and restaurants overlooking the charming main square, is just 20 min by car. The apartment and its location has everything you'll need for a fabulous holiday providing easy access to everything. However, we also suggest you try and go further a field too as the variety of things to do and see in the area is endless. Horse riding, cycling, golf, swimming, paragliding, boat trips, surfing etc. Within the village itself, there is a bank, restaurants, a large supermarket, hairdressers and even a place for afternoon tea and cake! Oh and a cocktail bar! Sao Martinho is a seafood lovers dream where the catch of the day can be eaten as you look out over the water. It you want to go cosmopolitan for the day, then don't forget the colourful and vibrant city of Lisbon, Portugal's capital city, is only 50 minutes away by car and 1hr 30 mins by bus (pick up is from the centre of Sao Martinho-do-Porto). After a vibrant city visit full of tram rides, live music, museums and shops, you can then retreat back to your seaside village haven and luxury accommodation! Grutas da Moeda: (Coin Caves) are situated just outside the nearby town of Fatima. And we think these stunning limestone caves are well worth a visit too! Notes on prices There is an additional £55 cleaning and laundry fee. If you book for 2 weeks we are happy to organise laundry of towels/bed linen/cleaning apartment/making beds for you end of your first week for an additional £55. The apartment is priced at a weekly rate, however, if you would like to stay for a few nights as a stop over, then please contact us to discuss. We are happy to try and accommodate you! Changeover day Changeover day is flexible. Check-in is from 1600 hrs (local time) on the day of arrival. Check-out must be prior to 1000 hrs (local time) on the day of departure. No pets. No smoking. Serviced apartment options available for fully catered holidays – please enquire at the time of booking.